*Fixed Orthodontics is a system of dental treatment whereby braces are fixed onto the teeth in order to move them to the desired position. Here, it is performed by senior orthodontists who are specialists in the field. Prior to treatment, a proper assessment of the patient is done by making Xrays, diagnostic models, photographs etc. The assessment helps in preparing a treatment plan for the patient. A post-treatment assessment is also carried out after completion of treatment employing photographs, models and Xrays wherever necessary. *Duration of the treatment - is highly variable – it depends on the age of the individual undergoing treatment, the nature of the corrective tooth movements involved and a host of other factors. Generally a time period of one year to a year and a half will be sufficient. However patients requiring complex tooth movements and those who are comparatively older, tend to require more time for completion of treatment than others. *Commencement of treatment and frequency of following visits – Treatment can commence only after complete scaling (cleaning), fillings and extractions (if they are required). Other treatment procedures such as periodontal surgery etc. may also be required prior to commencement of orthodontic treatment. Treatment starts with the placement of “separators” which facilitates placement of certain parts of the fixed appliance around the molar teeth. The first orthodontic appointment will be a long one as sufficient time is required for fixing the braces. After fixation of braces, the subsequent visits are generally short – for about half an hour. However, much more time may be required in the event of breakage or damage to the braces. Generally, a time gap of approximately one month is given between appointments, unless otherwise required. +The appliance is likely to cause certain amount of discomfort during the initial phase. This can manifest itself as ulcers in the mouth, difficulty in chewing and talking. Once the patient gets used to the appliance, these problems will gradually subside. In the event of ulceration in the mouth caused by the appliance, the drugs, mouthwash and ointment prescribed by the doctor are to be taken. Warm saline may be used for rinsing the mouth twice or thrice a day. If a sharp portion of the appliance is found to be the cause for the ulceration, you may cover up the sharp margin with a small wisp of wet cotton or a piece of wet sugarless chewing gum and report to the clinic at the earliest. +If the appliance gets damaged, kindly report to the clinic so that appropriate measures are taken. Please do not try to tamper with the appliance or try to repair the same yourself. If you are wearing elastics (rubber bands), kindly wear them in the manner you have been asked to. In case you miss an appointment, please discontinue using the elastics so that further tooth movement is prevented. In case any portion of the appliance gets dislodged and comes out, please retain them with you and hand it over to the doctor during your next visit. 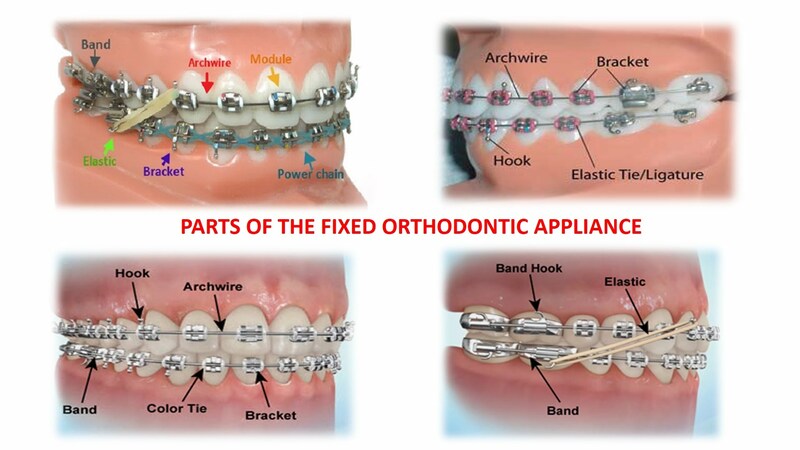 It would be ideal if the patient is able to identify various parts of the fixed appliance such as the brackets, molar bands, archwire, elastics and rubberbands. It helps improve communication concerning treatment. +Maintenance of meticulous oral hygiene is a must during the phase of treatment. If this is not done, food debris are likely to accumulate in the appliance spaces. This will further lead to tooth decay and gum diseases. Hence, lack of proper daily brushing will eventually lead to loss of the teeth, which we have been attempting to reposition. Brushing after every meal is desirable. Looking into a mirror, retract your lips and cheeks using fingers and then brush gently. You will be given orthodontic brushes, which is specially designed for use by orthodontic patients. +Do not have hard or sticky foodstuffs during the treatment period. If used, they can cause damage of the appliance, cause accumulation of the food debris on tooth and appliance surfaces and the spaces. Avoid chewing using the front teeth. Avoid aerated drinks as they tend to dislodge the bands and brackets by dissolving the bonding/cementing medium. +Avoid all activities that tend to apply pressure on the appliance thereby damaging it. These include boxing, wrestling, forcible wiping your face with towels etc. +Ulceration in various parts of the mouth is likely to develop during the first few days after fixation of the appliance. You may apply the anesthetic gel suggested by the doctor in the area of ulceration. +After completion of fixed appliance treatment, you will be given a removable retention-appliance. This is meant for maintaining the position of the repositioned teeth. This appliance has to be ideally worn for a period of total one and a half years – the first 6 months day and night, the next 6 months night alone and the last 6 months on alternate nights. The appliance need not be worn during food intake. Discontinuance of the retention appliance can cause relapse – ie., return of the teeth to the original position, prior to treatment. Please remember: If proper care is not given, your teeth may be permanently harmed after wearing braces. Hence, you must follow the instructions given above meticulously. *Do not hesitate to seek clarifications with the doctor(s) if you have any. *Please contact us one week prior to your scheduled appointment to confirm the same. *Kindly keep appointments. If you miss an appointment, your treatment period will certainly get prolonged. If, due to unavoidable circumstances you have to change the appointment date / time, kindly inform us at the earliest.